The powerful tribe of the Libyan rebels’ slain military commander vowed on Tuesday to find justice themselves for his suspicious killing last week if rebel leaders failed to investigate it fully. General Abdel Fattah Younes’s death, apparently while in the custody of fellow rebels bringing him back from the front line for unspecified questioning, raised fears of deep divisions in the rebel camp, something the tribal ultimatum only underlined. “The way he was killed looks like a betrayal, so until now we are trying to calm and control the youth of the tribe, but we don’t know what could happen,” one of Younes’s sons told foreign reporters when asked if rifts could turn violent. He declined to be named but spoke on behalf of the family gathered around him, following a crisis summit of leaders of some 90 tribes led by Younes’s Ubaideyat tribe, one of Libya’s biggest, at the family ranch in the rebel stronghold Benghazi. After two days of confusion, rebel leaders said on Saturday the assailants were militiamen allied to the rebels in their struggle to overthrow Libyan leader Muammar Gaddafi. Few details have been revealed — even, the family says, to them. “They (the tribal committee) will investigate who issued the arrest warrant and who sent whom to arrest him, how was he lost. They said he was dead but they couldn’t find the body, so how did they know he was dead if there was no body?” the son said. The family complained to Reuters on Monday that the rebel leadership was dragging its feet over its own investigation into the murder, which they said smacked of conspiracy and treason. They said they would if needed turn for help to the International Criminal Court in The Hague, which has issued an arrest warrant for Gaddafi over alleged crimes against humanity. Younes was shot dead with two aides at some point after he was summoned to Benghazi by the Transitional National Council (TNC), the rebel leadership now recognised diplomatically by many Western states. “If the council (TNC) doesn’t bring us justice, and if the (international) judiciary don’t bring us justice, then we will leave it to the tribe to bring us justice,” the son said. 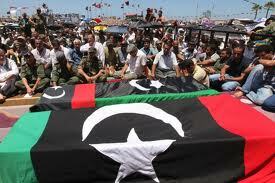 Tribes have a huge influence in Libyan society. Younes’s tribe, from the rebel-held east, numbers about 400,000. Family members say the TNC has not yet formed its announced investigation committee nor named any of its members. On Tuesday the son said the tribe had refused to let TNC officials attend mourning days where people pay condolences to the family “because the tribe was upset, they feel that either the council had a hand in it or they are neglecting it”. For years Younes was in Gaddafi’s inner circle before defecting in February at the start of the rebels’ uprising to become their military chief. Muatsem Abdel Fattah Younes, one of his sons, said on Monday he only found out his father was dead from watching television. He said he had talked to Younes on Thursday at 2 a.m. after he heard that armed men had surrounded his father’s headquarters in the town of Ajdabiya. Bodyguards who accompanied him on the way to Benghazi were stopped by armed men and stripped of their weapons. Younes’s body was found on Friday in the suburbs of Benghazi, burnt and with gunshot wounds. Two officers with him were also killed. Officials say a militiaman was arrested and confessed his subordinates had killed them, but have not given details. Younes’s nephew said on Monday it seemed there had never been any plan to question him in Benghazi. “If there was an intention to investigate him, they could have called him and he would have followed orders, but there was no intention of that,” Mohammed Hamed Younes told Reuters.